When we make plans, God laughs. 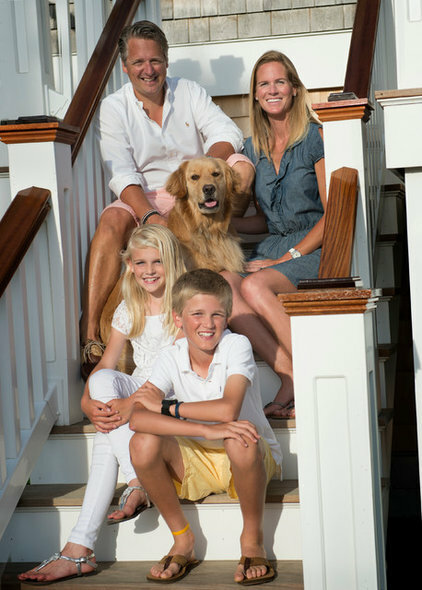 Or so it would seem for Chris and Shannon Nelson and their two children, who, after living overseas for years, planned to move back to the States and make their family beach house their full-time home. 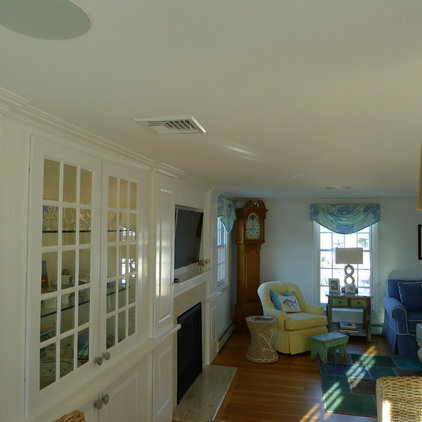 Their 50-year-old Cape Cod–style house was located in Mantoloking, New Jersey, 110 feet from Barnegat Bay and 200 feet from the Atlantic Ocean. They had strong family ties to the town — Chris grew up there, his parents lived across the street, and his family loved to spend time there in the summer. 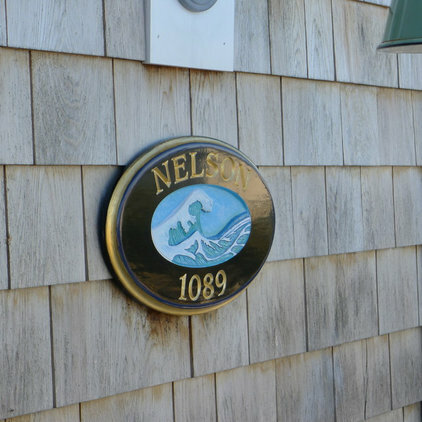 They moved to Mantoloking in June 2012 and fixed up the casual summer cottage as their primary home, establishing themselves in the small community of year-rounders. 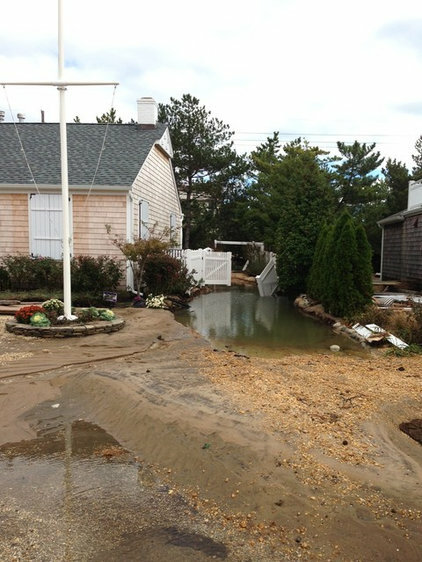 But a few months later, Hurricane Sandy hit the town hard, and they had 2 feet of water on the first floor. Ultimately, many of the homes in the small community were lost. The family was homeless and needed to make big decisions about whether they’d stay in Mantoloking or reestablish themselves somewhere else. “We had to decide whether to cut bait and move out or go all-in,” Chris says. The family mulled it over and decided to stay. The house is located in Federal Emergency Management Agency (FEMA) flood insurance zone AE, which means they can expect potential wave action but not the direct impact of large waves — those areas are designated zone V. There are different building requirements for the different flood zones. 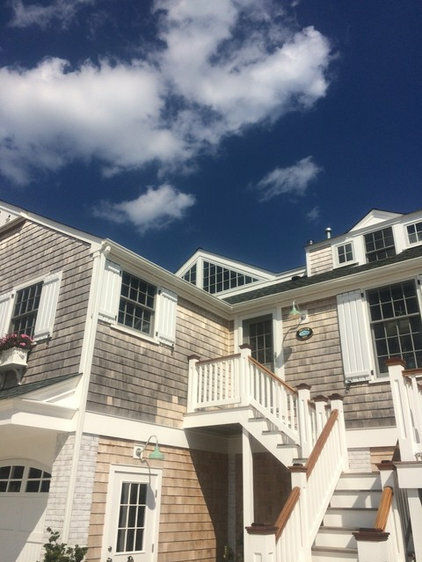 Rather than replacing the windows with hurricane-proof ones, the Nelsons put in operable shutters that they can bolt shut. They have plywood cut out and ready for the large triangular windows. 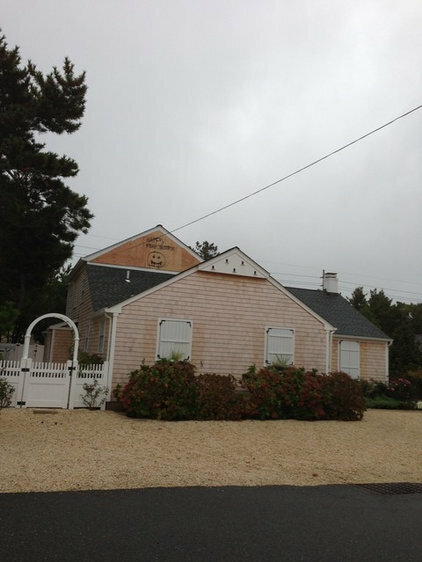 BEFORE: Prior to the storm, the family covered up their big windows and went to safety. The plywood has “Happy Frankenstorm” written in spray paint. (The storm had been unofficially dubbed “Frankenstorm” because the hurricane was predicted to meet the cold front on Halloween.) At the time they had no idea how devastating the storm would be. 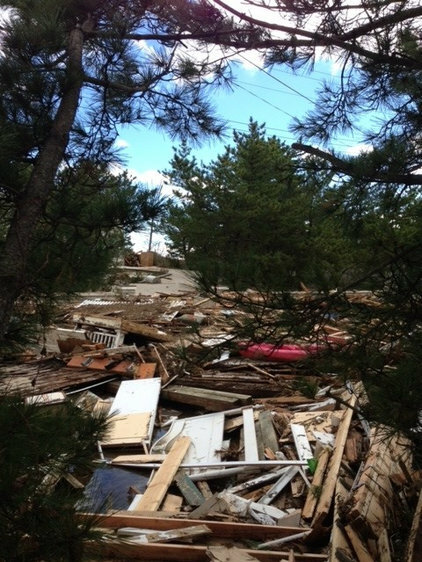 He adds, “It was not enough to wash away the memories that we had or cloud the memories to come.” The family knew they were lucky that their home’s structure had stood up to the storm fairly well, but there was an overwhelming amount of work to be done. BEFORE: Nelson enlisted architect friends Patrick Burke and Verity Frizzell to help with the architectural and engineering challenges. To fortify the house so it would stand up to hurricanes in the future, they lifted it 9 feet. To be as prepared as possible, they engineered the house almost completely to the requirements for the worst possible flood insurance zone (zone V) even though their zone eventually was changed to AE. They used the most stringent structural system and hurricane strappings in the roofing and floor joists. 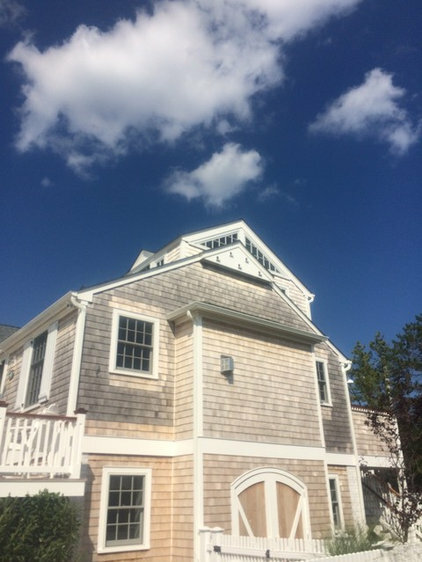 The house was lifted to 12 feet above sea level. The structural system is made up of 30 helical piles that extend 27 to 35 feet into the ground and then tie into a grade beam. Aboveground, they surround the steel rebar supports that extend up from the piles with a concrete-formed brick-like block to give the look of columns. If the water ever makes it up as high as it did during Sandy, it will wash through the garage and the house will stand strong. AFTER: Its height gives the mostly salvaged house new style, with stairs that change the front-entry experience. They gained a cozy landing along the front entry where they can chat with neighbors, many of whom are interested in and inspired by the rebuilding process. With the new flood insurance rules, living spaces and items like HVAC systems can no longer be located on the first floor. 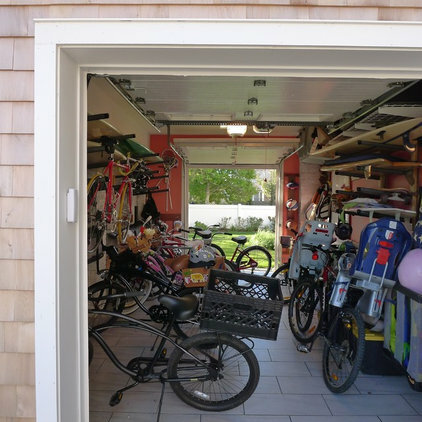 However, the home’s lift created much-needed garage space for three cars, bikes, surfboards, sports equipment and other storage. 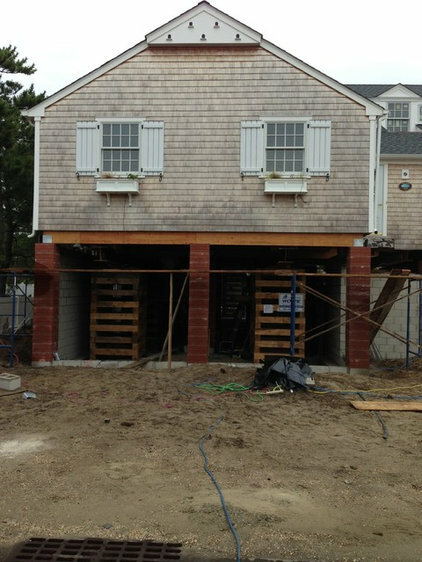 Before the post-Sandy construction, they had a one-car garage that wasn’t really even large enough for their car. On this side, they gained a new toolshed behind the barn doors. 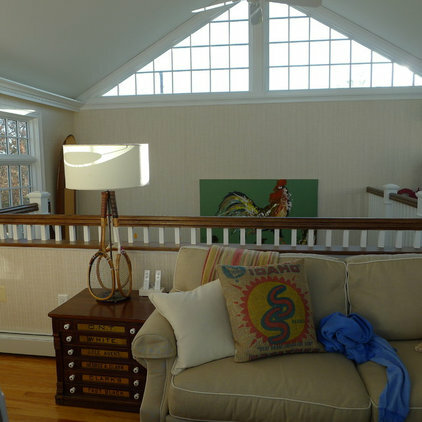 The former one-car garage has been raised up to the second level and serves as a cozy family room. 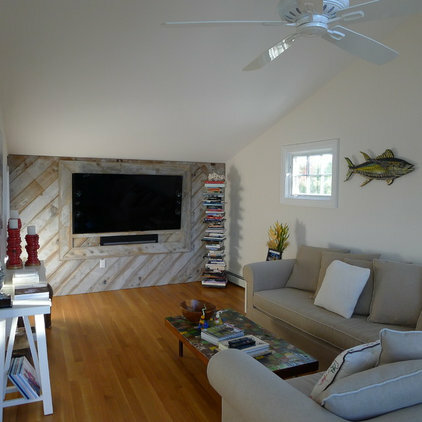 The accent wall was crafted from reclaimed wood from a local boatyard. The storm did not put the family off nautical themes or celebrating their coastal location whatsoever. If anything, there is simply a new respect for the power of nature. 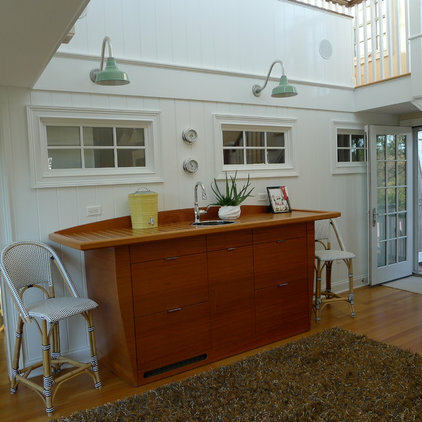 This main-floor mahogany bar, built by Chris’ talented retired cabinetmaker uncle, has a boat-like look. 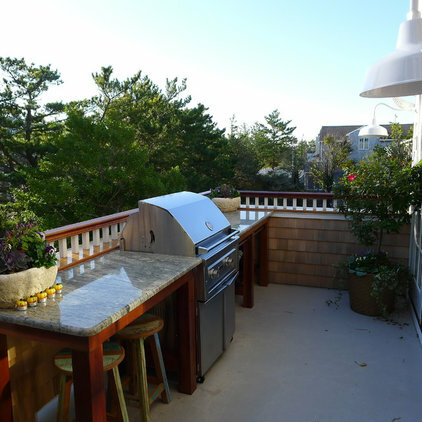 To the left of the bar in the last photo is a new outdoor deck with a grilling station. 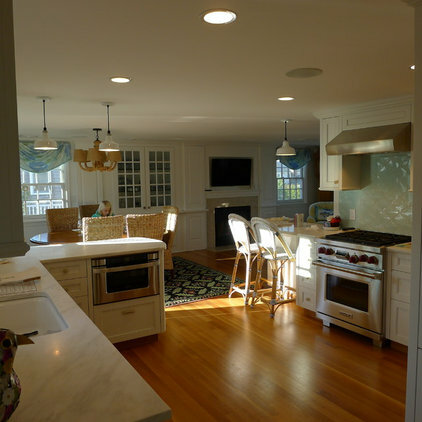 The granite countertop was salvaged from the old kitchen. The new layout keeps plenty ofconnections between indoors and out in spite of the 9-foot elevation. The family gained some new views from the new height, if only temporarily. Chris’ parents decided to stay put too and jacked up their house across the street, once again blocking some of the views. The family was happy to lose the views for this cause: loved ones investing in the community and staying put. Stairs lead from the side yard up to the new back deck we saw in the previous photo. 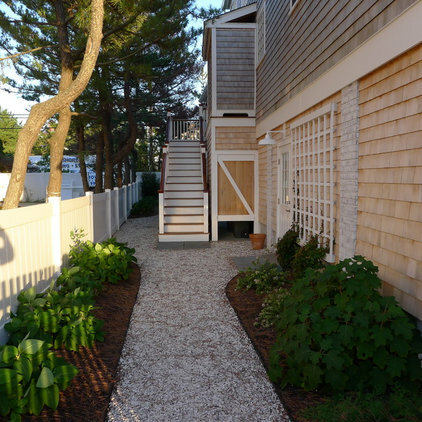 This creates a strong connection from the raised house to the yard. 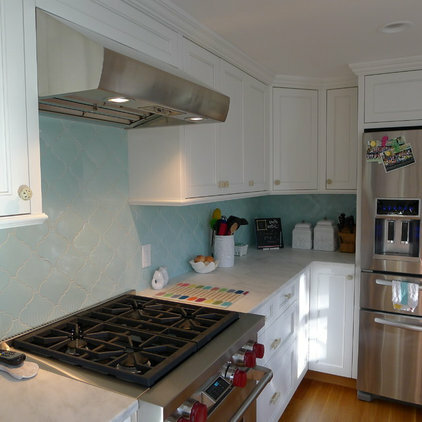 The couple got their dream kitchen out of the renovation. Chris’ uncle came out of retirement to make new cabinets for the family. “These will be the last cabinets he makes,” Chris says. His uncle helped with several projects around the house. 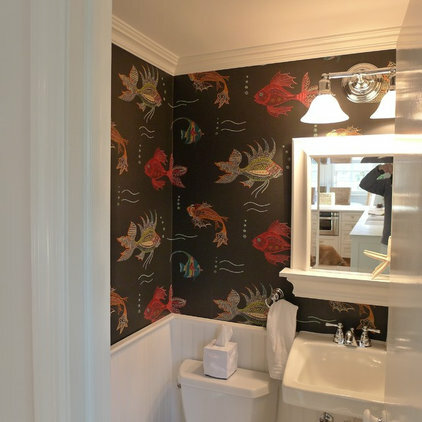 This powder room celebrates the sea with playful fish wallpaper. A built-in china cabinet displays favorite items in the main-floor living room. The family was able to save a few items of furniture by putting them on concrete blocks after the flood. 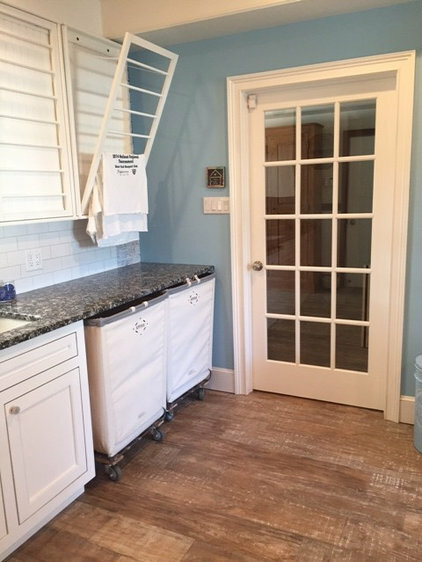 A new laundry room has granite countertops, built-in drying racks and large hamper bins that can be slid underneath the countertop. Radiant-heat controls are behind the laundry racks. 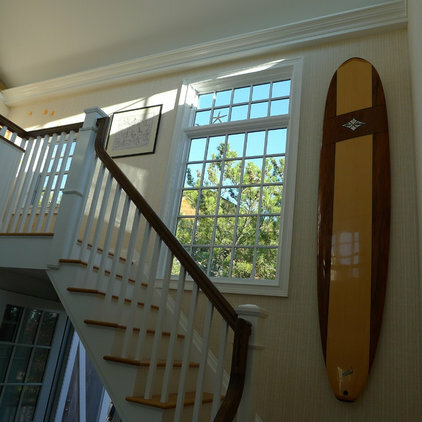 A beautiful wooden surfboard marks the staircase to the third level. 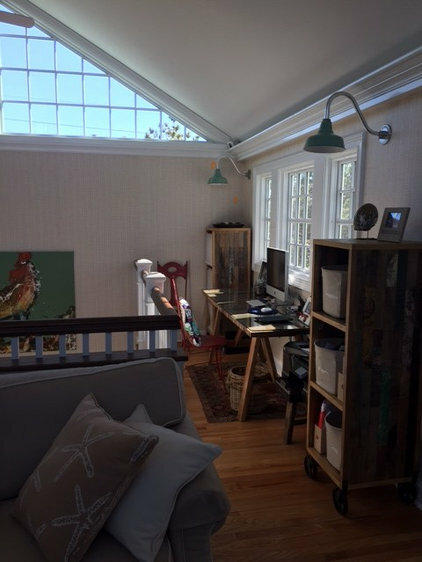 Shannon Nelson had the idea to make the third floor a kids’ lounge. The side table is an antique spool thread cabinet; the lamp was crafted from antique racquets. 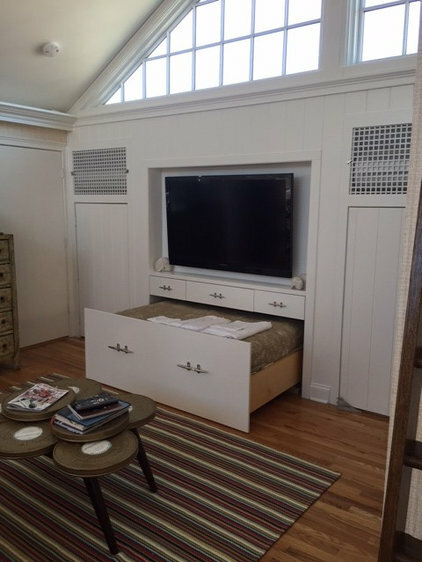 The third-floor lounge also serves as a guest suite, thanks to this pullout bed made byChris’ uncle. The area is great for sleepovers for the kids, and the family enjoys hosting friends and family in the redone house more than ever. The homework table and bookcases upstairs were made from retired wooden fishing boats from Bali. The family’s last overseas location was Jakarta, Indonesia. They brought back the painting of a rooster with them. The triangular windows are a stunning part of the original architecture that they wanted to preserve. 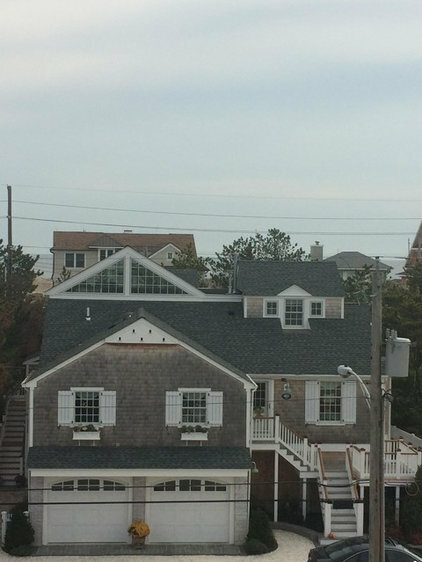 The windows survived Sandy thanks to the plywood coverings. 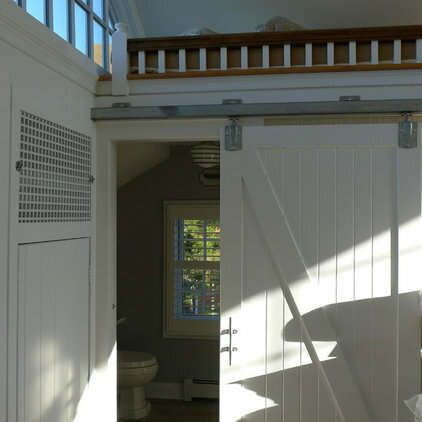 A sliding barn door leads to the third-floor bathroom. The barn-door element is repeated throughout the house, which provides continuity. There’s a sleeping loft overhead. 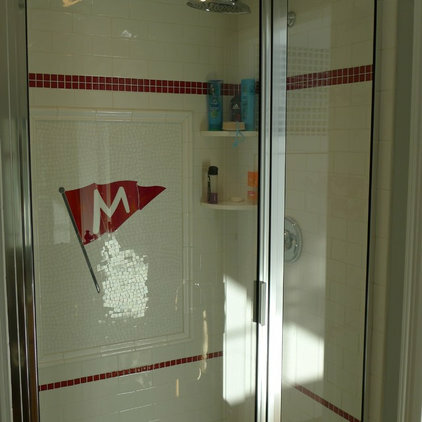 Custom tile represents the local yacht club, where the family enjoys sailing their Sunfish and having Friday-night dinners with other members of the community. BEFORE: This is the condition of the backyard after the storm. 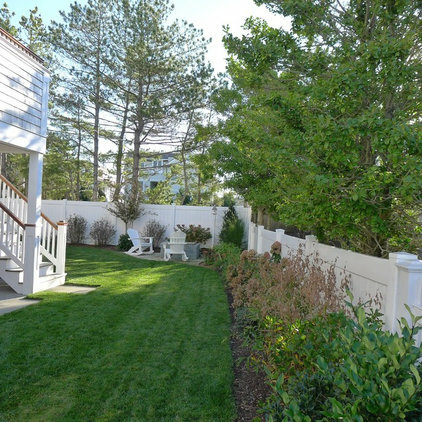 AFTER: With its newly installed landscaping, the yard is in better shape than ever. 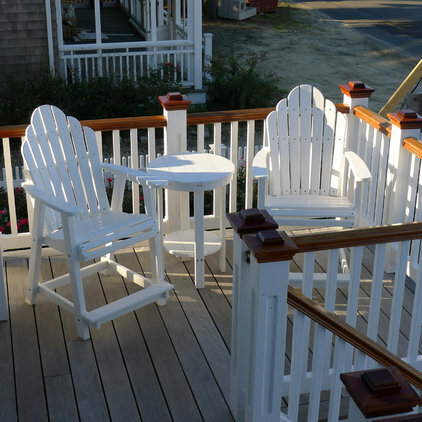 Here is another outdoor connection to the main floor of the living space via the new deck. The family also has a fire pit they love to use on chilly nights.